I realized when we got back from Europe, after ogling over this photo and totally loving it, that I have a thing for taking pictures of things off-center. (Case in point... Here and Here and Here and Here. I could go on forever apparently!) There's just something about it that catches my eye. So, with that being said, enjoy this newly off-center photo! The background story? Right... so this was taken in Schwerin, Germany. I'm sure I'll get to the actual trip update for that adventure soon. 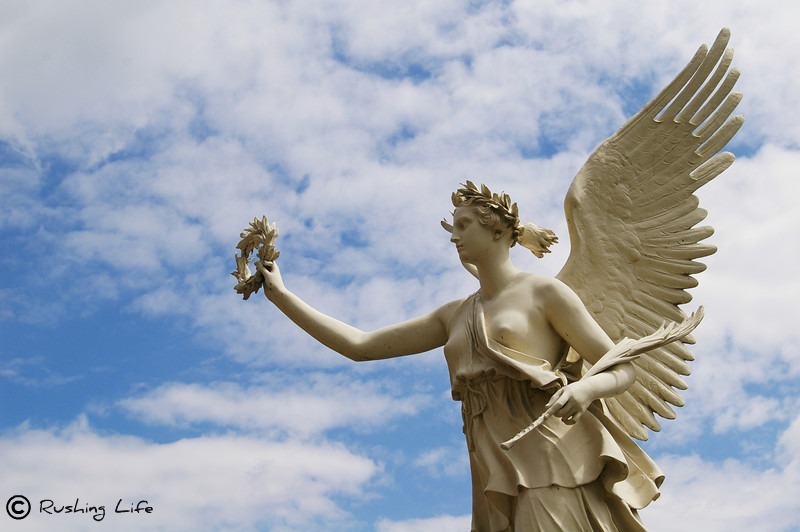 This was a statue at the Schwerin Palace, on their beautiful, lovely, grounds overlooking a lake. Don't let the gorgeous blue sky fool you... it was chilly and windy that day! But regardless of the weather... don't palaces just exude something romantic and wonderful? Even when naked statue-boobies are involved? Yeah... I think so!